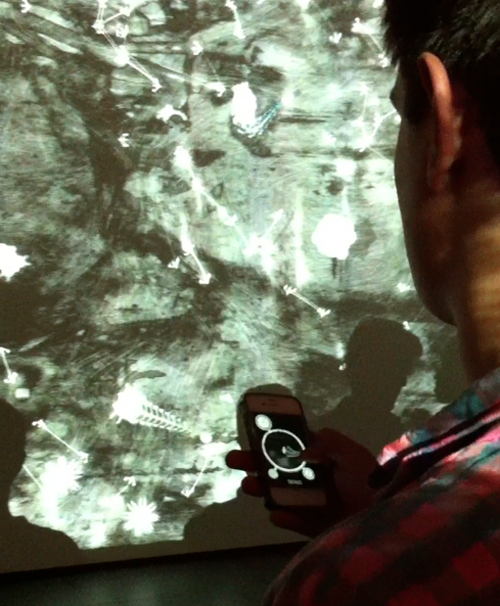 Rhizome | Blog Posts tagged "moma"
Louis Doulas | Tue Mar 6th, 2012 10:04 a.m. Spread across three tables, publications culled from around the world are surprisingly not rendered dead and embalmed under the vitrine coffin that most library material usually exhibits within, but instead can be found alive and well, waiting to be sifted through and handled. Curated by Rachael Morrison and David Senior, Millennium Magazines features magazines and journals spanning a broad range of subject matter including photography, art theory, design, architecture and social activism. Though diverse, each one encapsulates an experimental future forward ethos driven by an independent small publishing spirit. 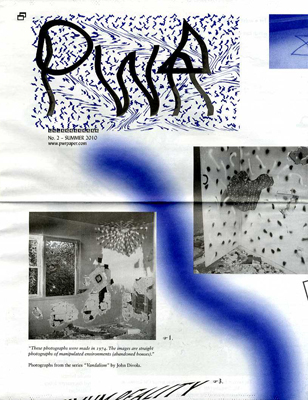 The 102 featured publications begin from the year 2000 and feature familiar faces such as Fillip, Mossless, Triple Canopy and Bidoun but also include many burgeoning international winners such as White Fungus, PWR Paper, Institute for Social Hypocrisy and Junk Jet, to name but a few. Included also in the exhibition are monitors showcasing footage of the publishing process. The show continues online as well, featuring a website with links to each and every exhibited publication. There is plenty of diversity here and one will surely find something new and refreshing, both content and design-wise. Millennium Magazines is on view at the MoMA through May 14, 2012. Nick Hallett | Wed Dec 21st, 2011 11:25 a.m. 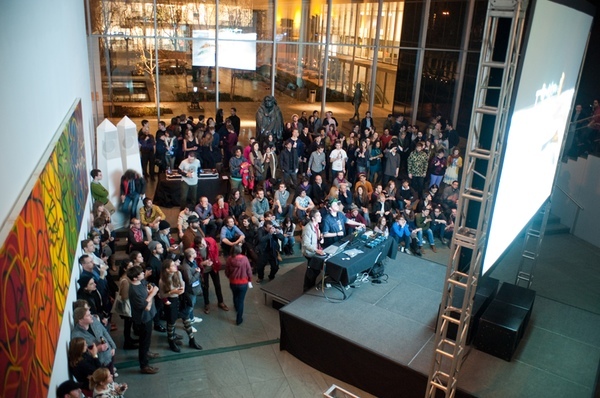 This past weekend, MoMA presented a collaboration between electronic musician Daniel Lopatin—who records under the moniker Oneohtrix Point Never—and video artist Nate Boyce, as part of its PopRally series of art parties. While not an overly serious gathering, Boyce and Lopatin delivered an hour of strobing, structuralist-minded imagery over relentless digital throbbing. Each of the work’s sections was based upon a specific object in the MoMA’s sculpture collection and the overarching title, Reliquary House, suggested a congratulatory pat on the back for the museum. PopRally events are more often than not thematically connected to what’s concurrently on MoMA’s walls, while in this case the institution’s history was the tie-in. The video screen displayed 3-D renderings of modernist forms by Isamo Noguchi, David Smith, Jacob Epstein, and Anthony Caro, which gyrated in “impossible” landscapes evoking the Panopticon look of the music video to Nine Inch Nail’s “Down In It.” To clarify their intention, Lopatin began each movement with details of the image being projected—dates, dimensions, curatorial texts—dictated by robotic voices a la Siri and the Hitchhiker’s Guide to the Galaxy. Within the foreboding visual environment, these came off as provocations of a sort, which gave way to beds of digital glitches and rollicking bass oscillations, positing a bleak underbelly to the neutrality of the subject material. Boyce and Lopatin, who often communicate a sense of humor about the austerity of contemporary tools and approaches in their work, perplexed the droll audience, who perhaps expected Lopatin to perform the angelic synthesizer music indicative of his latest record, Replica. Boyce and Lopatin stood ground side-by-side, facing their laptops, but more often were caught gazing up at the video screen. 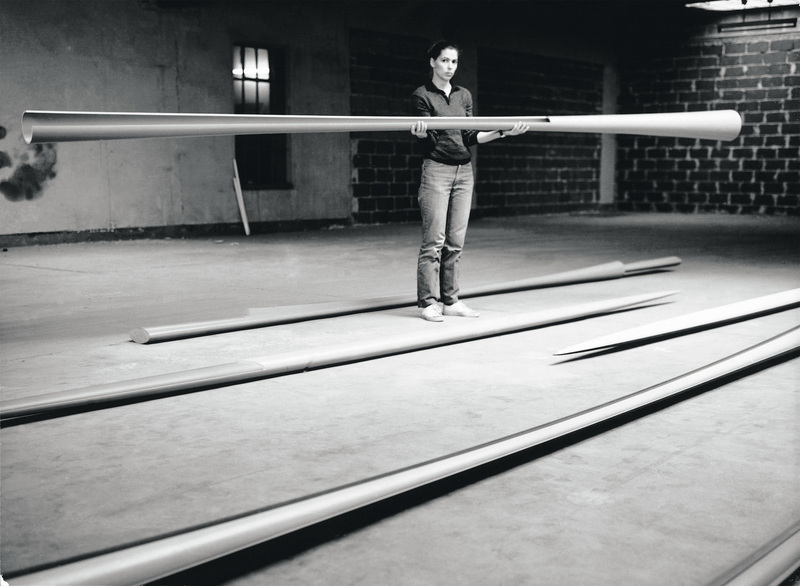 Jason Huff | Mon Oct 24th, 2011 5:10 p.m.
Talk to Me: Design and Communication between People and Objects is an ambitious exhibition at MoMA curated by Senior Curator in the Department of Architecture and Design, Paola Antonelli. Focused on new modes of communication and interactivity, the exhibition captures over 194 works from an international group of aritsts and designers. The space is divided into five themes and includes work ranging from Jason Rohrer's minimalist game Passage (2008) to Sputniko! 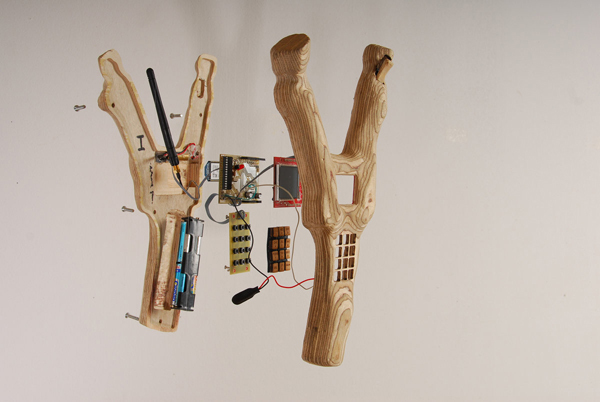 's role-reversing Menstruation Machine-Takashki's Take (2010). After touring Talk to Me on a rainy weekday with Paola, we met in her office to discuss the importance of collaboration, QR tags, and speculate about the future. Jason Huff: You have curated numerous shows on the frontier of design and its intersection with technology among other fields. Design and the Elastic Mind, from 2008, stands out because of it’s timing within the latest rush of social technology and interaction that has arguably become the norm over the past few years. 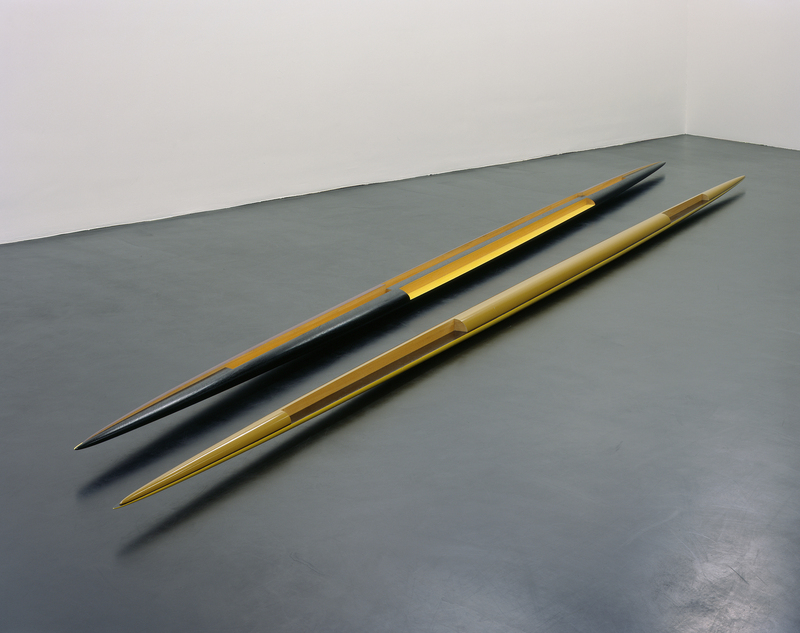 What makes Talk to Me distinct in this lineage of exhibitions? Paola Antonelli: In Design and the Elastic Mind, the communication between people was just one of the facets as it was about design and science in general. Therefore, there was a really big presence of synthetic biology, for instance, or nanotechnology, nanophysics, robotics. There were a lot of different topics involved. Thinking back, pieces like Google Earth, Google Moon and Google Mars from Design and the Elastic Mind would have fit in [Talk to Me]. So could have the One Laptop per Child project. Jason Huff | Mon Aug 8th, 2011 2:55 p.m. 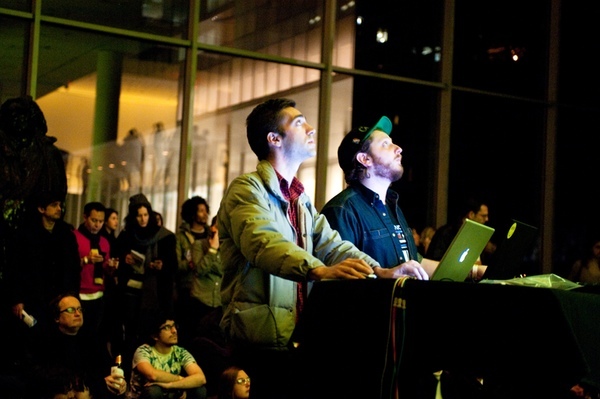 Kill Screen curated a sold out Arcade two weeks ago at MoMA's July PopRally. The museum was packed with art and game enthusiast actively trying their skills with an array of eleven games spread across the first three floors and the garden. I'm a closeted game addict so the event culled no shortage of interest from me. I started out the night playing Starry Heavens, a large turn-based installation of networked dots predicated on a feudalist hierarchy, with a group of friends and the game's creators, Eric Zimmerman and Nathalie Pozzi. The giant heilium-filled weather balloons floating above the game's stage added a Calvino-esque ambience and a minaturizing sense of scale. B.U.T.T.O.N., a game built specifically on unfair tactics located inside the Museum's lobby, quickly shifted the slow pace of Starry Heavens into a frenzy of subversive button smashing, shouting, and friend pushing. JH: What was your thought proces behind choosing that particular group of games? JW: We chose games that reflected the breadth of developments in games over the last five years or so. As you know, the Arcade was tied to Talk To Me and the communication between objects and ourselves. So we wanted to find games that did the same thing -- that spoke different languages. LIMBO, for example, was chosen for its aesthetics and the monochromatic dream world that Playdead had created. Bit.Trip Beat was chosen for its pastiche and how it blends an old convention (Pong) with something new (sound). B.U.T.T.O.N. was chosen for its physicality and Canabalt was chosen for its austerity. We wanted a wide range of new experiences for attendees to explore. One overall principle was to chose games that were easy to learn and interesting to watch. There were 1,000 tickets sold for the event so the environment needed to be one where we could cycle people quickly through games while not boring those on the periphery. There are other games that are wonderful but don't lend themselves to that type of setting. JH: How did you choose the locations for each game? Was based it simply on available space or linked somehow to art that was in the locations before?